This site was developed to advance the movement toward international recognition of March 25th as the "Day of The Unborn Child," and equally to promote among Christians the observance of this historical feast day of the Incarnation honoring Christ’s conception (once celebrated as New Year’s Day) now known as the Feast of the Annunciation. The significance of the date can be more readily understood if we highlight the fact that it comes nine months before the day commemorating the most celebrated birth in Western civilization known throughout the world as the December 25th feast of Christmas. Regardless of whether one emphasizes the secular or religious aspects of the March 25th memorial, the symbolic interval of a full-term pregnancy reminds us of the reality, importance, and dignity of human life from day one at the moment of conception. "25th of the Month Club"
The archive link is important for any site that includes hard-to-find information, and if technical problems or site upgrades prevent you from accessing our website, an older version will still be available at what is known as the Wayback Machine -- basically an archive of websites. Just go to the link: https://web.archive.org/web/*/http://dayoftheunbornchild.com -- (you can then click your device's option/icon to "star," favorite, or bookmark the site -- or just take a screenshot of this paragraph). Once there choose the most recent version of the site (slide towards the current year and choose the most recent year that shows saved versions) and then scroll to the most recent month, click the date, and then click the link to the snapshot of that date. You should get an older version of this site to browse through. The text, information, and graphics will be there, and the internal links and navigation within the site should work, but please note the events listings won't be current and some of the outside links may not work -- but the majority of the content will be there. (The Wayback Machine is useful for research on many topics where up-to-date information is not essential, and for accessing hard-to-find info on old websites no longer currently hosted on the web). Visit our Local & National Events page to check current listings by state and city. If there is a special upcoming Annunciation or Day of the Unborn Child event that you would like to see listed, or if you would like to share ideas and traditions for celebrating the day, contact us with details (including website links if possible) at info@DayOfTheUnbornChild.com. Use Our Free E-cards for Both the Annunciation and Christmas. Send An E-mail to Mar25Dec25ecard@dayoftheunbornchild.com and you will receive our dual-season e-card to forward to family and friends. Since you will receive our e-card in your inbox you can use your own e-mail program and contact-list/address-book to forward it to as many recipients as you like, as often as you like -- and keep it to use on both holidays. Also downloadable as note/post-cards, the festive design covers both the springtime and the winter feasts -- so you can raise awareness about the significance of March 25th while checking off your Christmas card list. Click HERE for full details and tips and other cards and banner options. Click HERE to view our selection of banners and instructions on using them to promote the Annunciation as the Feast of Christ's Conception/Incarnation or as Day of the Unborn Child and the start of a "9 Months 4 Life" period of Spiritual Adoption prayer. The page also features multi-season banners to highlight the Annunciation/Christmas/New Year's connection during the holiday season or year round. Why use a Christian feast to promote the universal cause of unborn children? Why is the Feast of the Annunciation so important to the pro-life movement? Can secular pro-life groups honor March 25 simply as the Day of the Unborn Child? Why isn't the feast honoring Christ’s conception more widely celebrated? What if my church moves this year’s Annunciation feast to a day near the 25th? How can we use the day to teach children respect-for-life before the “facts of life” talk? Was Christ conceived on March 25th? If the Annunciation is the feast of the Incarnation, how should we view Christmas? Why is the Annunciation celebrated in the busy Lent/Easter season & how do we highlight it in that context? Which denominations have the Annunciation feast as part of their tradition? Is the Annunciation a feast of Christ or a feast of Mary? What can I do the rest of the year if the day has already passed? Why use a Christian feast to promote the universal cause of unborn children? Why not choose a new date for a secular Day Of The Unborn Child? It would be hard to find a date that has more universal import than the Annunciation feast day of March 25th (once observed as New Year's Day) in its symbolic link to a historic birthday celebration known worldwide. Christmas is recognized around the world and its celebration transcends cultural, racial, national and class divisions--therefore the feast day that precedes it by the length of a pregnancy is an ideal choice for a cross-cultural memorial for the unborn that can similarly transcend varying faith traditions. In fact, the Vatican.va page promoting the Annunciation feast as "The Day of the Unborn Child" notes that when the movement began in Argentina the official 1999 proclamation was made in the presence of representatives from the Orthodox, Anglican, Evangelical, Jewish, and Muslim faiths. Likewise, the date of the Annunciation as "Day of the Unborn Child" can be honored by those of no particular faith tradition who advocate the right to life for secular philosophical reasons. Clearly there is no absolutist line of separation between the overlapping spheres of state and faith-influenced culture based on the precedents we’ve already set in national holidays like Christmas and the way we measure time. Even the most secularized nations and governments use a calendar that has the approximate date of Christ’s birth as its starting point. Atheist scholars accept the conventional division of history into B.C. (before Christ) and A.D. or Anno Domini which means “in the year of the Lord.” As such, governments that officially adopt this date as a day of remembrance for the unborn are well within the norms of what is already practiced in modern democratic nations. Even if March 25 were not a Christian feast, it would make perfect sense to remember unborn children on the day that falls nine months before the international celebration of the most widely recognized birth in Western civilization. It should be obvious that the decision to choose this day for a national observance reflects a common cultural language and in no way approaches a “theocracy.” In rightly affirming the protection of unborn children as a secular cause, it should also be noted that much of what we take for granted as civil human rights (i.e. laws against infanticide) and humanitarian progress (provision for the poor) grew out of 2000 years of Christian moral philosophy and charitable works. Just as the season of Christmas honoring the birth of Jesus has become a time for cross-cultural charitable endeavors to help children of all faiths, the Annunciation feast date as "Day of the Unborn Child" can become an annual focus for solidarity in our charitable action toward children in the womb. In recent years perceptive pro-life parents began annual celebrations of their children's "First Days" nine months before their birthdays--recognizing that if everyday practices don’t reflect the reality of their beliefs they send a counterproductively mixed message. At this same time, some Christians, particularly those in the pro-life movement, began to recognize that Christ's “first day” of human life passed by every year virtually unnoticed by the majority of believers; commonly there was no obvious celebration either private or public--those churches that observed the feast had services for the day, but attendance was generally no greater than a normal daily mass. And this was no ordinary “first day,” for unlike the natural conception of children who are created beings, this was the moment that Christ the Eternal Word became flesh by the power of the Holy Spirit--it was the “first day” only of His human earthly life that he shared with us. This is what Christians call the Incarnation--the moment God became man. As the word “incarnate” (to be made flesh) implies, this was accomplished not when Jesus reached adulthood, or was revealed to the world at his birth--it happened when he took on human flesh at his conception in Mary’s womb. The Incarnation as an event had a specific time and place, as simply stated on a plaque in Nazareth’s Church of the Annunciation: "Verbum caro hic factum est"--"the Word was made flesh here." The pro-life significance of this statement in the context of the Annunciation is addressed in an American Life League article (on cloning) that reprints the first chapter of professor John Saward's "Redeemer in the Womb." In reflecting upon this momentous occasion, we can find inspiration to combat the “out of sight out of mind” tendency that attaches itself to all hidden realities, even the central reality of the Incarnation. If the Christian community as a whole does not consistently recognize and honor the conception and prenatal life of Christ who is God, then it should come as no surprise that the secular world has so little regard for the newly conceived life of an "unplanned" child, who is neither divine nor anxiously awaited nor announced by angelic herald, but is simply unwanted, like so many others. It is essential for all Christians to not only remember but celebrate the fact that the Word was made flesh in Nazareth nine months before Christ's birth in Bethlehem. Fortunately it is not necessary to wholly invent a “first day” tradition for Christ. Early in Christendom (probably the 400’s) Christ’s first day was already memorialized. Now known as the Feast of the Annunciation, officially it is still the principal feast of the Incarnation, and was universally celebrated by the 600’s. In the past it had been named Festum Incarnationis and Conceptio Christi--titles that highlight the fact that Christ's conception/Incarnation is being commemorated. Celebrating March 25th in remembrance of this reality (and as The Day of the Unborn Child as many nations are now doing) will be a wonderful spiritual counterpart to the celebration of Christmas, which has unfortunately become so commercialized and secularized. Keep in mind also that the Annunciation is not only one of the most frequently depicted events in art, but is also the most frequently depicted conception. It is quite remarkable that an event that takes place unseen inside the human body should become one of the most popular iconic themes for a visual medium like painting. Wouldn’t it be tragic if such potentially powerful pro-life imagery were lost on even the most faithful Christians because they were never taught the significance of the Annunciation as the occasion of Christ’s Incarnation and therefore don’t see its powerful pro-life implications. (For more on the Annunciation in art, read A Note On The Artwork). In sum, raising awareness of the meaning of the Christian feast whose date has been adopted for a secular pro-life day of remembrance complements that cause, just as Christian clergy assisted secular civil rights workers in the 1960’s. The participation of an ordained Christian minister like the Rev. Martin Luther King, Jr. (who frequently referenced God in his civil rights speeches) did not limit his movement, or make voting rights an exclusively religious issue. Likewise Christian understanding of the Annunciation will not interfere with but may actually be a necessary step on the way to establishing the Day Of The Unborn Child as an annual secular memorial. Certainly a pro-life political organization or pro-life pregnancy center that serves all faiths can honor this date as the “Day of the Unborn Child” without any overtly religious promotion of its roots as a Christian feast. Just as many secular organizations choose Christmas (feast of the Nativity) for special charitable works and outreach, secular pro-life groups can choose the date of the Annunciation feast for a special event to raise funds, start a baby item donation drive, or to launch a new educational campaign such as the FirstDays and +9 (plus nine) programs. In the case of secular activism these can be promoted simply as “Day of the Unborn Child” events. However those involved with the activities should be aware of the origins of the day and be prepared to answer any questions about why that particular date was selected for pro-life action--the answer can be simply stated as follows: Just as Christmas is a time of special outreach to children among even secular charities, this date of Annunciation Day honoring Christ's first day in the womb (nine months before Christmas) has been chosen as a special time to help unborn children. It should also be recognized that the staff of these organizations are most often people of faith, and that although direct evangelization may not fit with that group’s particular mandate, questions that arise from attendees, participants, and clients themselves are perfectly legitimate opportunities to share a bit of Christian history as it relates to Christ’s conception as the Incarnation, and for the many Christians who work in such organizations to share their belief in that central tenet of the Christian faith. As noted at the end of the previous answer, though the mission of secular and religious movements is not identical, there has traditionally been a broad area of overlap in which both causes are enriched by each other’s efforts. Why isn’t the feast of Christ’s conception more widely celebrated? What could be more central to Christianity than the Incarnation? The most important event of your life is your conception--for that is what makes all the rest possible, including your salvation. Though Christ is the eternal Word -- the uncreated second person of the Trinity, had he not become that tiny embryo at a particular point in time, there would be no atonement on the cross, and no resurrection from the dead. But the conception of Christ is infinitely more than just the beginning of a pivotal trajectory -- it is the instant God became man -- when the Word was made flesh -- the most mysterious and awe-inspiring moment of history. To introduce the subject of celebrating this event, it is important to note that the March 25th Annunciation Day feast once had the most pointed and widespread celebration possible for it marked the beginning of the year in the old pre-Gregorian calendar, but gradually in the 16th to 18th centuries, countries began to adopt the new January 1st New Year’s Day. This loss of secular significance was compounded by several factors impacting the awareness of its religious significance. Post-reformation approaches to de-emphasize celebration of holy days, particularly those that are Marian, may have marginalized the Annunciation in churches that mistook the day as a feast only of Mary rather than its true status as Incarnational feast of Christ's conception. Related to this factor is the fact that titles for the feast, both formal and informal, have varied throughout history. Names may not change the nature of things, but they do direct our attention. Two of the earlier titles--Conceptio Christi (Conception of Christ) and Festum Incarnationis (Feast of the Incarnation)--made it clear that Christ’s Conception/Incarnation was being commemorated. Although “Incarnation” is still occasionally used (as by Pope John Paul II) to refer to the feast, the more common title “Annunciation” is named after the angel’s message--only the first of the events in the Biblical account of Jesus’ conception, all of which are to be commemorated on the feast day. Likewise, although the current title "Annunciation of the Lord" focuses on Christ, the previous title "Annunciation of the Blessed Virgin Mary" highlighted the Marian aspect of the feast, as did the informal "Lady's Day" (Our Lady's Day) used in England. Moreover, for Catholics--although it retains the high rank of a solemnity (from “sollennis” meaning “annual”)--the feast is no longer a universal holy day of obligation in terms of required Mass attendance, though it is remains so in some nations. As such, though in a liturgical sense it is widely celebrated geographically, the non-obligatory status makes it a challenge to get large numbers to attend and to promote understanding of the centrality of the feast and its full meaning--this is especially difficult if people assume they are only celebrating the delivery of a message albeit a heavenly one. One theory for why the decision was made in the Catholic Church to make Annunciation mass attendance optional is the idea that holy days of obligation should concentrate on feasts that are distinctively Catholic (as was done with the obligatory Marian holy days) which might otherwise fall by the wayside in the larger culture with varied faith traditions; the assumption being that the Annunciation feast of Christ's conception/Incarnation is so important that it will be celebrated by all Christian denominations creating a general cultural awareness strong enough so that people won't need to be told to attend church. However, in our modern secular age that assumption can no longer be made; the culture did not maintain the Annunciation's prominence, and though in the case of Christmas this cultural awareness/cross-denominational celebration did popularize the December 25th feast to the point where people might be expected to attend church even if not required to do so, the Catholic Church nevertheless maintained Christmas as a holy day of obligation, and this likely prevented the erosion of church attendance on and religious understanding of Christmas. Another theory suggests that the Annunciation receives less emphasis than Christmas because Annunciation falls within Lent--a penitential season that tends to subdue celebrations--and this most certainly has had some effect particularly in recent centuries as Annunciation Day as a holiday has faded from the wider culture. However, it is also the case that the solemnity of a liturgical season can be suspended for a day, as happened historically when Annunciation Day was celebrated as New Year's Day, and as happens today during Lent in Laetare Sunday to provide a respite, and on Gaudete (meaning joyful) Sunday during Advent which was once a penitential season leading to Christmas--so it is certainly possible to have a true celebration of the Annunciation during Lent compatible with the traditions of the season. The influence of Lent leads into the next factor to be considered--competition for time and attention during the Lent/Easter season; far more than any conscious decision to tone down the Annunciation celebration, today it is far more likely that the feast is simply being overlooked among the many worthy Lenten/Easter practices and events. Due to the season in which it necessarily falls, without a determined effort to highlight its importance the feast is often lost among the Holy Week observances leading up to Easter. Additionally, measures to avoid Lent and Easter-season conflicts by moving ("transferring") the feast one or more days in those years (sometimes into April), reasonable as they may be in theory, have the practical effect of obscuring the nine-month interval before Christmas that would underscore the day’s significance (although a church or diocese can take opportunities on both the 25th and the transferred day to teach via the mass homilies about the usual date's meaning and the reason for the current year's "transfer.") Another important factor is the confusion stemming from the fact that many people mistakenly believe the day Jesus was conceived is already being celebrated on the Feast of the Immaculate Conception, when in truth this is the Catholic feast for the day Mary was conceived; understandably, if they are not acquainted with the practice of celebrating Christ’s conception on the Annunciation feast, they may simply assume it must be celebrated on the feast of the “Immaculate Conception”--a term which, to add another complication, is indeed used by some Protestant denominations to refer to the conception of Jesus. [See the "Use Web Banners" page for a memory-aid you can share to distinguish the two.] To summarize the factors that explain why the Annunciation isn't more widely celebrated: The switch to the Gregorian calendar with its January 1st New Year, the varying names for the feast, post-Reformation de-emphasis of holy days particularly one often mistaken for a purely Marian feast, the move to non-obligatory status for mass attendance, competition for time and attention in the Lent/Easter season, periodic celebration of the feast on varying "transferred" dates, confusion of the Annunciation with the feast of Mary's Immaculate Conception, as well as general cultural secularization, have all played a role in suppressing awareness of the Annunciation's import--but the good news is that these can be mitigated and remedied by education and enthusiasm for restoring the feast to its former place of prominence in Christian life. Clearly there is much need for education and clarification on these matters, and widespread observance of the traditional March 25th Annunciation feast date not simply as the celebration of the Incarnation, but additionally as Day of the Unborn Child not only helps to focus on the plight of the unborn, but also helps Christians to more fully understand and appreciate the true Incarnational meaning of the Annunciation and its feast as a day set aside to celebrate Christ's conception. What if my church has moved this year’s Annunciation feast to a day near the 25th? Though the traditional Annunciation feast date is March 25th, the celebration of the Annunciation feast day is often moved one or more days in years when it would conflict with other important holy days in the season of Lent and Easter which fall on specific days of the week and therefore on different dates of the month. The Roman Catholic Church for example, transfers the feast in these cases; Anglicans and Lutherans also transfer the feast in years with a conflict, but they may differ in the criteria used for whether or not to transfer and what day to transfer it to. Different formulas for moving the feast in years with Lent/Easter conflicts have been used in the past. The current Roman Catholic practice is that if the March 25 Annunciation falls on a Sunday of Lent then it is "transferred" to the following Monday, if it falls on Palm Sunday it is celebrated on the preceding Saturday, and if it falls during Holy Week or the Octave of Easter it is transferred to the Monday of the Second Week of Easter. As such, oftentimes it is celebrated several days after the 25th, even into April. In transfer years, the church bulletin should explain the reason for the change in that particular year, as well as the significance of the usual March 25th date, which can also be reinforced to the congregation in the feast day sermon. See our web banner page for a general graphic to use in any "transfer" year as well as a banner for the specific date if it's moved. Note that the Eastern churches (Eastern Orthodox, Oriental, Eastern Catholic) generally do not change the day, but commonly use April 7th for the feast as this is their equivalent to March 25th in the old-style calendar they use, which differs from the modern Gregorian calendar by thirteen days. The important thing to remember is that when it is moved, the feast as such is best celebrated with your congregation on the day designated for that year. Participation in whatever official celebration is offered will encourage greater attendance and focus on this feast day in the future. For Catholics, when no other events are planned, this may simply mean joining your parish for the daily mass on whatever day the Annunciation has been transferred to that year. In transfer years the two dates present an opportunity for two types of observances, with the intervening days creating a mini-season of preparation for the celebration of the feast. In those years when there is a change, March 25th can still be an occasion for special public pro-life events or the start of multi-day activities leading up to the transferred feast day, as well as private/family gatherings and pro-life prayer. While it is true that any move away from the 25th poses a challenge to highlight the instructive pregnancy-length interval between March 25 and Christmas, it also presents an opportunity to "bookend" the two dates of March 25 and the transferred celebration date with life-affirming activities that reinforce the pro-life message over a multi-day period. This is important because unlike Advent and Lent that are seasons with many opportunities to absorb their meaning over several weeks, the Annunciation feast is one day. When it is transferred, announce the fact and the reason on or before its usual date of the 25th, and take advantage of the intervening days to encourage attendance at the official celebration of the Annunciation and to raise awareness about the feast’s Incarnational significance and its pro-life emphasis highlighted in the Day of the Unborn Child observance. For example, a pro-life event on the 25th can include reminders to attend the official Annunciation mass on the upcoming transferred feast date for Christ's conception. Another positive and easy way to use a long interval is to have a multi-day event or activity such as a baby-item drive that accepts donations from the 25th through the day on which the feast is being observed. This not only benefits the needy but educates the congregation about the life-affirming significance of these days as well as providing an occasion to promote attendance at the concluding Annunciation mass and/or any related events--a notice in the bulletin can explain the reason for the start/end dates and a sign on the collection bin and a nearby info table can include the day/time of the Annunciation mass as well as some brief historical background on the feast. A closing after-church get together with refreshments could be offered in keeping with the "feast" day and as a thank you for donors. Other examples of multi-day events that can span the gap are two or three-day conferences, missions, or retreats with a pro-life/Annunciation/Incarnation theme. When the feast is moved, some "Day of the Unborn Child" events will remain on the 25th while others will be moved along with the transferred Annunciation--either way, it is important to show support by attending--the positive reinforcement of a good turnout will help perpetuate them. Even if you can't have a multi-day baby-item drive or event to bridge the gap, the March 25th event can effectively highlight the importance of and increase attendance for the upcoming Annunciation mass, which should always be of extra special significance for the pro-life Christian/Catholic community, but especially for members of the pro-life community attending a DOTUC mass. In marketing terms it's the same "target audience"--those attending a Day of the Unborn Child mass would most likely be interested in the Annunciation mass celebrating Christ's first day as an unborn child. For example, a Day of the Unborn Child prayer service or mass on the 25th can publicize the upcoming Annunciation feast with signs, fliers, opening and closing announcements, as well as a homily/sermon that explains the significance of the usual March 25th date and its transfer that year. When this separation between the two days and their respective events does occur, it also allows, if desired, different aspects of the feast to be emphasized on distinct but linked occasions connected in both theme and time--the March 25th Day of the Unborn Child as a time for pro-life prayer in remembrance of all the unborn lost and for the welfare of those living, and also a time to encourage attendance at the second more celebratory occasion of the Feast of the Annunciation mass and/or related events at which we give thanks for the Incarnation at Christ's conception and reflect on its meaning--the celebration of the "feast" is an ideal time for an after-church parish coffee/dessert get-together or benefit dinner to raise funds for a pro-life pregnancy center. Keep in mind that even in years when churches celebrate the feast more than a week after the 25th, it should be kept in mind that this time period preceding Christmas is still a good estimation of the gestational stage of life. The nine-month interval intended in the usual feast date of March 25th was wisely chosen as a well-known symbol of a pregnancy, but it is still only a symbolic approximation--just as the actual period of human gestation varies, the number of days between Christmas and the celebration of the Annunciation feast will vary slightly depending on whether the latter feast is transferred in a given year--exactly nine months in theory, and nearly nine months in practice. Either way, recognizing the gestation-length period reminds us that it is Christ’s conception we are celebrating. For more suggestions, please see our Ideas page. How can we use the Annunciation to teach respect-for-life to children too young for the “facts of life” talk? For Christian parents it is perhaps both the easiest and most profound way to plant the pro-life seed, as the feast offers a rare opportunity to teach children about conception without addressing the reproductive act while also imparting the central Incarnational truth of the faith. Indeed, the traditional celebration of the Annunciation is an ideal time to introduce even the youngest children to the concept of life before birth, for the conception of Jesus by the Holy Spirit can be freely discussed with those who have not yet had the "facts of life" talk. This is especially important for instruction in faith-based schools, inasmuch as parents, including those who share the same religious and pro-life values, may differ on what age is appropriate to broach the subjects of procreation and abortion--even for the welcome purpose of teaching the sanctity of life. Just as the celebration of FirstDays roots children in the pro-life ethic before they even become aware of abortion, the celebration of Christ’s conception as the first day of His earthly life reveals the reality of prenatal existence to children too young for the biological explanation of natural conception. The topic of Christ’s supernatural conception is uniquely inclusive of all ages, and its inherently pro-life message makes it the perfect vehicle for sanctity-of-life lessons in Christian education, especially in the lower grades where extra sensitivity regarding age-appropriate content is required. 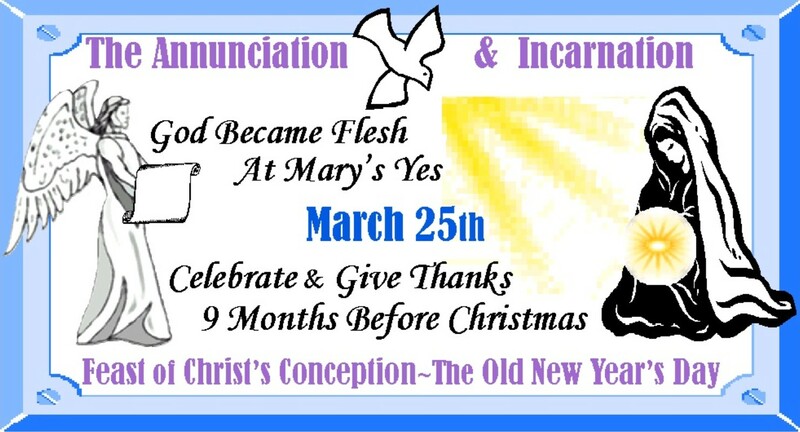 The Christmas connection also makes Annunciation Day child-friendly--children look forward to and are eager to start the countdown to December 25--now they have a genuinely good reason to begin nine months in advance on March 25. Although the Incarnational conception of Jesus with its pro-life implications can be taught at any time, it is important to make the most of this opportune occasion on the feast day with which it is honored. There is an early tradition of March 25th as the possible date for Christ's conception--see Historical Background for details. As with the date of Christ’s birth, it cannot be verified by the standards of modern historians. But it is important to remember that even today with modern biological knowledge, the date of a conception is almost always an educated guess. That doesn’t dissuade pro-life parents from celebrating their children’s “First Days” nine months before their birthdays. The most widely promoted view is that the Feast of the Nativity (later known as Christmas) was set on December 25th to purify the pagan practices of the winter solstice, and that the March 25th feast was chosen based on this date. However there is an early tradition of the ancient church that teaches Christ was conceived on the date of His death, which was believed to be March 25, and that the December date for Christmas was decided based on that date -- St. Augustine refers to this in his writings from the early centuries of Christianity. Whether absolute or relative and regardless of which feast date came first, what matters is that we keep in mind the pregnancy-length interval -- that the feast of Christ's conception occurs nine months before the celebration of His birth on December 25 -- it is here that we find the consistent reflection of the reality that Christ’s Incarnation was accomplished at his conception in Nazareth, and that conception is the beginning of every human life. We should neither be surprised nor disturbed that the precise date of Christ’s birth would not have been seen as essential information in the New Testament era. The modern celebration of birthdays and need for documentation puts an emphasis on recording exact birth dates that had not been the norm throughout history and across cultures. Indeed it is not the norm in some countries today. Even if the exact date of Christ’s birth and conception could be determined, such absolute dates would have no more pro-life significance than the feast dates that were chosen. As a practical matter the gestational symbolism is achieved even if the first date were chosen randomly as long as the second date is placed consistently in relation to it. We should also stop to consider the possibility of supernatural foresight in the early centuries of Christian history when the date to celebrate Christ’s conception and the date to celebrate His birth were wisely set a pregnancy-length interval apart--an amazingly prescient decision reflecting the reality of prenatal life one-and-a-half millennia before the biologic facts were fully understood. The symbolic pregnancy interval can also be seen in the Catholic Marian feast dates--the feast established in 1477 honoring the Virgin Mary’s conception (Dec. 8) was set nine months before the feast day of her birth (Sept. 8). It is the relationship between the two dates that is important. Which denominations have the March 25th Annunciation feast on their official calendar? Although actual practice in individual congregations will vary, Catholics, Lutherans, Anglicans, Episcopalians, Orthodox (and related churches), and others that follow a traditional liturgical calendar already observe this feast with the other major Christian celebrations. If your church is among these, you need only to renew and revive an established tradition and bring out its Incarnational and pro-life significance. Those churches that do not have the feast on their official calendar can establish a tradition of celebrating March 25th--the day that falls nine months before Christmas--in honor of the first day of Christ’s human life in the womb, and as a general Day of the Unborn Child; an older name for the feast (Incarnation/Conception of Christ) can be used to clearly indicate that it is the commemoration of the beginning of Christ’s earthly life--the moment that God became man in the flesh. Note that the Annunciation is celebrated on April 7th by many Orthodox churches and others that use the Julian calendar (plus the Armenian church, albeit for a different reason) -- for more information on the April 7th tradition see the Ecumenical Celebration page. Historically it has been regarded both as a feast of Christ and Mary. From the various titles the day has been given over the years, we can see that some of the earliest (Feast of the Incarnation, Conception of Christ) and the recent Annunciation of the Lord put the emphasis on Jesus, while other titles like the Annunciation of the Blessed Virgin Mary and England’s Lady’s Day highlighted the role of Mary in assenting to God's will. The artwork on the opening page vividly illustrates how difficult and unnatural it would be to speak of the Unborn Christ without mentioning Mary. Whether or not one's spirituality encompasses a special love and respect for the Blessed Mother, all Christians can agree that for both Jesus and Mary, and the whole human race, the moment when God became man in the womb of a virgin in Nazareth is the most awe inspiring event of history and should be commemorated, especially today when prenatal life is under attack. What year-round ideas can I use to promote the feast if the day has already passed? If you’ve missed the feast day you can still participate in and promote the feast in several ways. Follow us on Twitter @March25info or the Facebook AnnunciationDayMarch25 page for Annunciation-related news, TV specials, seasonal web banners to share, and reminders for pro-life activities every 25th of the month--including "25th of the Month Club" year-round suggestions and "9 Months 4 Life" Spiritual Adoption prayer (both described below). Many holidays have a historical link to the Annunciation and provide an opportunity to send/post festive greetings highlighting that link. See our year-round listing of relevant Annunciation-related dates to promote awareness of the day's import. Easter is the most timely occasion since it usually falls less than a month after and is still the fourth most popular holiday greeting card -- print, post and share our Easter-Annunciation Card or, our Easter, Annunciation and Good Friday banner which can be printed as a top-fold card -- both note the traditional teaching that Christ was conceived and died on the date of March 25th which would explain why the Annunciation feast of His conception and the Easter feast of His Resurrection come at the same time of the year. But the broadest and most natural opportunity to promote the Annunciation at other times of the year is the long Christmas/New Year holiday season from late November through early January -- affording many occasions to point out the 9 month March 25/December 25 interval and the Annunciation as old New Year's Day. In addition to using the Christmas/New Year's banners, to get an early start, share the Virtual Advent Wreath link here http://dayoftheunbornchild.com/VirtualAdventWreath.htm from the start of the Christmas season through December 25th as a quick, easy and fun way to introduce people to "Annunciation Day"--the click-the-wick style on-line wreath gives an Annunciation/Christmas greeting when the last candle is "lit." Before and throughout the holiday season see the "Highlighting the Christmas Connection" section in our Ideas page for opportunities and suggestions for using web banners, cards, gifts, and all your December mailings to promote awareness of the nine month link between the Annunciation and Christmas, and its importance as the old New Year's Day. Many other holidays and seasons have an Annunciation connection and the web banners page has graphics with themes as varied as springtime, April Fools' Day, tax season, the feasts of the Blessed Mother's conception and birth in December and September, and even the calendar itself -- all of which reference Christ's conception feast. But in any season you might suggest or offer to help with an event for next year by contacting a local church or pro-life group. Promoting the celebration of "FirstDays" nine months before birthdays and sending out "FirstDay" greetings is a related outreach that can be done anytime reinforcing the idea of conception as a day to commemorate -- two of the "Plus 9" and "FirstDay" graphics on the web banners page mention or allude to March 25th -- the Remember to Think Plus 9 banner and the Celebrate FirstDays Like BirthDays banner. Whatever the season, any Christian prayer group can propose the Annunciation as a focus of thanks and praise for the gift of the Incarnation. Individuals can also introduce the theme into public prayer--for example, if praying the Rosary always remember to add a brief description when announcing the first joyful mystery "The Annunciation" such as, "--when Christ was conceived" or "--the Word was made flesh" or "--God became flesh at Mary's yes" to provide a fuller appreciation of what happened on that occasion and a more profound meditation. Another option for groups of any size is to start a "Twenty-Fifth of the Month Club" (locally or on-line with social networking) dedicated to understanding and promoting the Annunciation and its connection to Christmas year-round. "Spiritual Adoption" may be the most popular way to observe the March 25 to December 25 interval. Basically, Spiritual Adoption is a nine-month gestational period of prayer for an unborn child, in this case beginning on the Annunciation feast and ending at Christmas. This can be done as an individual or with others--use your own intentions or follow the "9 Months 4 Life" prayer journey from Annunciation Day to Christmas, which includes general monthly pro-life intentions and monthly prayer petitions for Spiritual Adoption. You may also be able to join a church Spiritual Adoption program (the monthly intention may be printed in the bulletin). Keep in mind that this nine month Spiritual Adoption can be joined in progress. For example, if March 25th has only recently passed, you might begin praying for an unborn child in the early embryonic stage at risk from accidental harm whose mother may not yet know she is pregnant, or for a child targeted by the abortion pill used early in pregnancy. If the feast was two or more months ago, pray for a child endangered by miscarriage or the common methods of surgical abortion. If you begin in the second half of the 9-month period following the feast (Aug.-Dec.), pray for a child in danger from premature birth or late term abortion and infanticide. You might choose your own specific prayer intention for the child that changes every 25th of the month. Click here for more on “Spiritual Adoption” or click here for a month-by-month list of Spiritual Adoption prayer intentions for "Nine Months for Life." To receive monthly "9 Months 4 Life" Spiritual Adoption prayer intentions, "25th of the Month Club" tips, and "FirstDay" reminders: click here to follow March25info on Twitter, or make a monthly visit to the Facebook AnnunciationDayMarch25 page. The image on the home page was used by permission and is the property of John Brandi Company--it appears on their "Our Lady of The Millennium" prayer cards and art prints. With its simplicity of form, understated colors, and light emanating from Mary’s womb signifying the hidden Christ, it is a beautifully poignant and thought-provoking depiction of the mystery of the Incarnation. Artistic renderings of this event are usually given the more broad title of “Annunciation” which encompasses the three events of the angel’s announcement, Mary’s consent, and the conception of Christ in her womb. The last of these, for obvious reasons, is the hardest to represent. The dramatic form of the archangel could easily detract from the unseen but all-important culmination in the Word made flesh. Traditional depictions showing Mary, the angel Gabriel, and the Holy Spirit in the form of the dove are beautiful and instructive, but are only correctly understood with guidance and meditation. For example, consider the recent experience of artist Michelle Paine, speaking about her studies of art in Orvieto, Italy: "Particularly of interest to me was the image of the Annunciation…this was an altarpiece...of the angel Gabriel and Mary and the Holy Spirit, and this was something that I thought about because I said, well, on the altar shouldn't there be Jesus -- where is Jesus up there -- He is supposed to be -- Jesus is the center of everything...so thinking particularly about the Annunciation, eventually...realizing that is the moment of the Incarnation, and that little Holy Spirit up there, coming in to Mary's womb, that's the moment that God the Word becomes flesh, that God comes to earth." [Quote from: The Journey Home, EWTN, 7/18/16, 8 pm] Unfortunately some early attempts to depict the Annunciation's Incarnational meaning in a more obvious way showed the infant Christ descending to Mary’s womb--which is theologically erroneous and aesthetically awkward. Disclaimer: This website aims to collect useful information and links as a convenience only. No affiliation or endorsement in either direction of the individuals/organizations referenced or linked is implied.